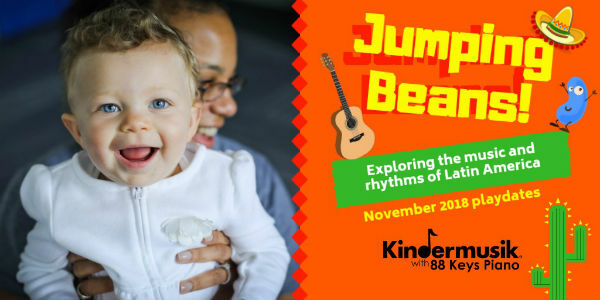 Kindermusik Savannah with 88 Keys Piano announces November playdates- JUMPING BEANS! You’ll explore the music of Latin America! Join Kindermusik Savannah with your 0-7 year old on Nov. 10, 14 & 17 2018 @ 10AM. All children receive an instrument, 10 Kindermusik songs & a $10 coupon. Cost: $15/child; $5 per sibling. Weekly family Saturday classes start on Nov. 3 2018 at 11AM. Enroll online today: kindermusikwith88keys.com or call 912-988-KEYS (5397). This entry was posted on Sunday, October 28th, 2018 at 8:29 pm	and is filed under Art/Culture/Entertainment, Classes/Programs, Kindermusik Savannah, Mommy & Me, Music. You can follow any responses to this entry through the RSS 2.0 feed. Both comments and pings are currently closed.